My fears came true — I killed my GoPro Fusion (reviewed here). It happened over the weekend, while I was working on my video review for the GoPro Fusion. Unfortunately, it got knocked over in one scene and you can see the lens got scratched up pretty badly. My plan was to skate over the Fusion. I had rehearsed the scene a few times with a practice target and was able to do it fine in the test shots, but on the actual shot with the actual camera, sadly I knocked over the Fusion! 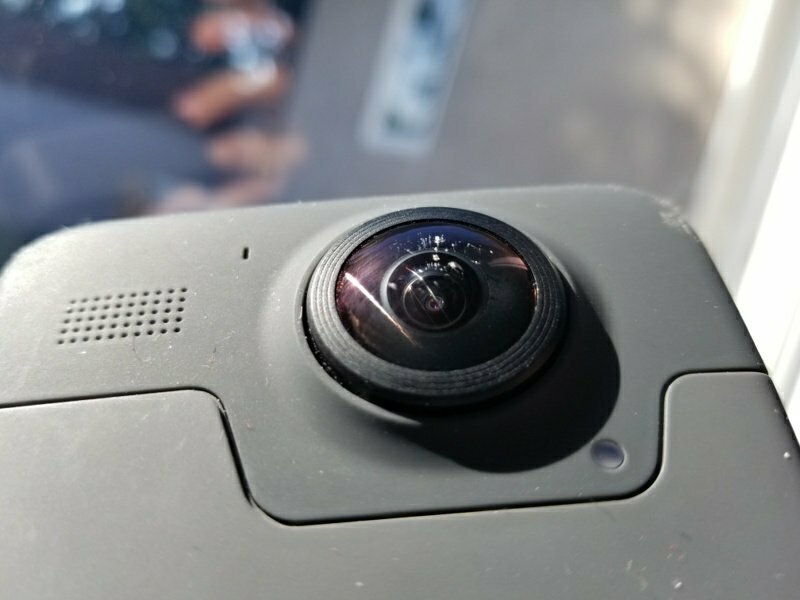 The Fusion is kind of pricey for a 360 camera, and unlike the Hero 5 Black or Hero 6, the lens is not user-replaceable, nor is there an external housing for it. That’s why I added GoPro’s protection plan when I preordered the Fusion. But GoPro’s current protection plan costs $5 per month ($60 per year) and it has a deductible, which they call a service fee, of $129. It’s a lot cheaper than having to buy a new camera at full price, but it’s not that cheap either. To GoPro’s credit they said they are thinking about making an exception and offering a replacement free of charge. We’ll see. At the time I bought the Fusion, Gopro.com was the only place to get the Fusion. But now you can also buy it from Amazon. 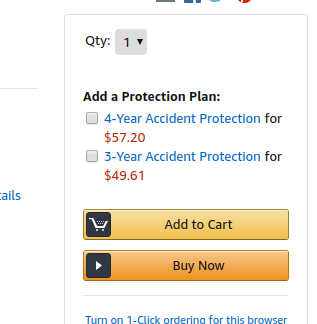 And that’s important because Amazon offers an protection plan that costs less (around $57 for 4 years) and has no deductible. Hopefully you will never need to use it, but if you get a Fusion, I very strongly recommend a protection plan — either Amazon’s or GoPro Care — until GoPro releases a housing for the Fusion. Tough one, Mic! Hang in there, hopefully they’ll consider the free replacement. Sorry to hear it, Mic. I didn’t kill mine, but I did sell it… so it’s dead to me. In the end, the issues in dealing with the camera were just too much when cameras like the MadVenture 360 make it so simple. Sorry to hear that, Mic. But you bring up a point I have often talked about with my colleagues: The difficulty in adequately protecting the fish-eye lenses used on 180 and 360 cameras. As a photographer, I always keep lens caps on my lenses and often use filters and hoods over them. But none of these will fit the often bulging fish-eye lenses found on “VR” cameras. And that leaves them particularly vulnerable. I noted when the Yi Horizon was being showcased at CES that there were many fingerprints on the demo’s lenses. It might seem “normal” in such a context, but yet it highlighted the fact that lenses sticking out in such a way make them particularly vulnerable. One must keep in mind that most people using compact cameras just slip them in a pocket. Most of these cameras have retracting lenses that retreat under a metal protective shield. But cameras such as the Yi (and many other2D 360 cameras) leave the lenses exposed and, as a result, they may can get scratched by other items in people’s pockets or bags. In other words, the problem exists due to the inherent design of such cameras even before you attempt to use them in a risky context. And speaking of “risky context”, I am reminded of the recent suggestion to twirl such cameras around one’s head in order to create first-person bullet-time clips. Such twirling is a great recipe for accidents, given people often don’t take note of obstacles all round them or might miscalculate the distance between the camera and such an obstacle while moving around. sorry to hear it Mr. Mic Ty.. Hopefully you will get a new replacement and make other rewiews. Seems like the main problem with 360 camera is that we try to do more dangerous stuff with it. Mine fall twice in the past few weeks, something that never happens to me with any other camera. With that said, good luck with GoPro! sounds like its time for you to review this now Mic ! I definitely would recommend against putting such a product on an optical glass lens. Lenses on camera are AR treated and such a coating could completely disable the AR properties and mess with the optical quality as well. did they offer in the end any solution? we’re in the same situation right now, and the only answer we got from GoPro is to go find ourselves the way to repair it. We think is a great mistreatment and we’re thinking to make a viral move if needed.